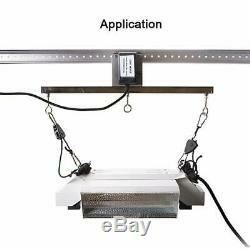 Origin Fleet 7ft Grow Light Mover Rail Kit for Hydroponic Lighting Systems. 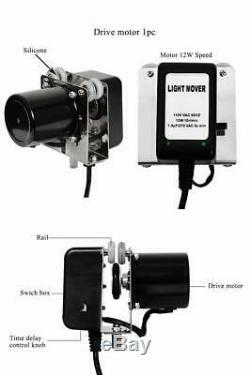 All in One Light Mover Kit Includes Motor, Rail, and 2 Pulleys. Works Well with Most Grow Lights Within 10 kg / 22 lb. Adjustable Time Delay Pauses Lights at Each End for Between 2 and 120 Seconds. Use Fewer Lights and Save Energy. BRAND NEW & 100% ORIGINAL. All parts included for assembly. Step 1: Slide the three pins into the end of one rail half way. Step 2: Line up the pins with the second rail and slide together. 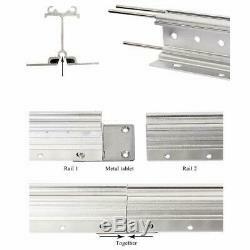 Step 3: (Optional): Use included metal tablet to secure the two rails together using supplied screws and nuts. Step 4: Find the included "stop bracket"(see picture). Using the supplied screws, screw it onto one end of the rail where you wish to have the motor stop. Wait to install the second "stop bracket" until the motor is installed. 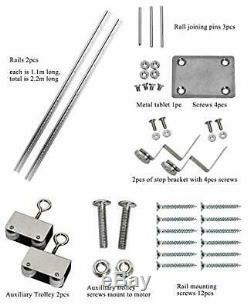 Step 5: Using the supplied wood screws, mount the assembled rail onto your ceiling. Most of our items are eligible for 60 days return. However some listings are only eligible for 30 days return. Any product you return must be in the same condition you received it and in its original packaging. We usually respond within minutes but no more than 24 hours. The item "Origin Fleet 7ft Grow Light Mover Rail Kit for Hydroponic Lighting Systems" is in sale since Tuesday, April 9, 2019. This item is in the category "Home & Garden\Yard, Garden & Outdoor Living\Gardening Supplies\Hydroponics & Seed Starting\Tents, Tarps & Shelves". The seller is "us-shop_online" and is located in Portland, Oregon.